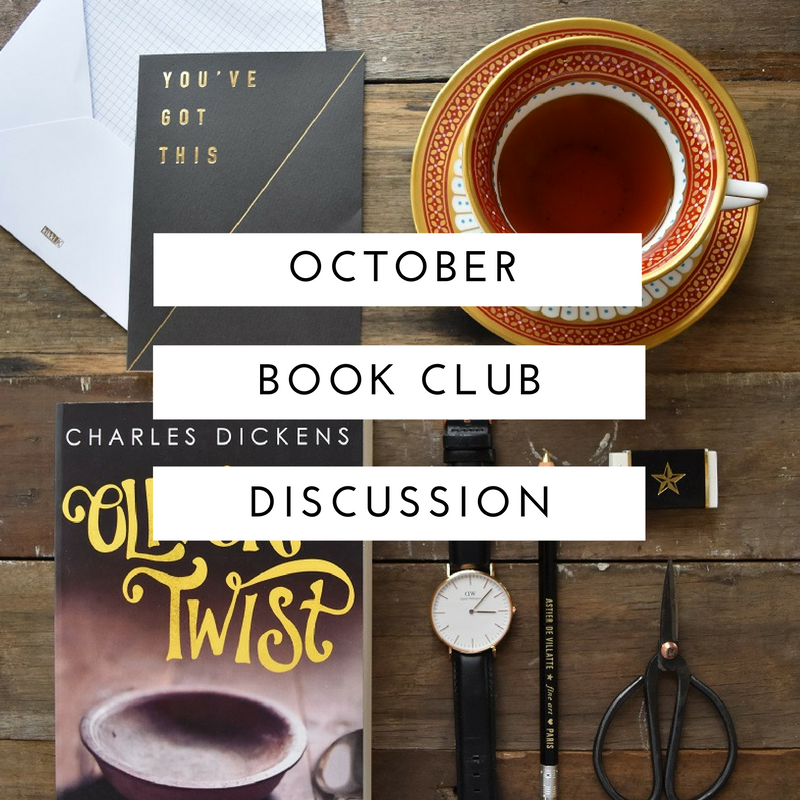 Let’s talk about Oliver Twist! It’s been great fun this month, collaborating with the Dickens Buddies group on Instagram. I hope you had a chance to add your thoughts to the weekly discussion posts, and are ready to sum up the whole book below! Answer any or all of the questions in your comment, and remember to check back to see if you have received any replies. 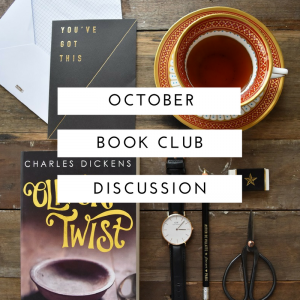 *Warning* The discussion below will contain spoilers for Oliver Twist by Charles Dickens. If you haven’t read it yet please look away. Overall what were your feelings/impressions of this book? Did you enjoy it? Women: How did you feel women were portrayed? Was there anything in particular that you liked or disliked about the representations of women? Favourites: Did you have a favourite character, scene or quote? What made them/it stand out to you? Language & style: How did you find the language? Were there any aspects of the style that you enjoyed or disliked? If Oliver Twist was set in the present day, what social issues or issues do you think Dickens would have set his sights on instead of orphanages & workhouses? Next month we will be reading Dark Places by Gillian Flynn, if you will be joining us don’t forget to use #babblingbookclub on your photos for your chance to be featured. 2. Throughout Oliver Twist women seemed to be presented as temperance, guidance, life givers, and manipulators, repeatedly referred to as being smarter or more clever than men, and yet none have any real power within the story. I found this deeply frustrating, as a modern reader, to see that women had so little agency in the tale. Nancy was the only shining light, and yet she was brutally murdered, and I could only see that as literary punishment for her sins, as there was no other way in the narrative to absolve the stain on her. She is also not the only woman to die for her sins, Oliver’s mother dies giving birth to him, a child out of wedlock. I highlighted this passage about the prostitutes and women of the lowest class, because I thought it was a great example of my frustration, where women are seen only to be women when their ‘virtue’ is intact. 5. I had to ask this question because it was one that I was thinking about all throughout my reading of this book. Oliver Twist brought to the public consciousness the deep ‘wrong’ that was the workhouse system and associated discrimination, which led to action far beyond a simple narrative. Because of the way he approaches issues, I think Dickens would go after other class-related inequality in modern society, perhaps in education – Western countries such as the UK are experiencing a decline in literacy for the first time since records have been kept for example. As a final note, why kill the dog Dickens?! It was so unnecessary and sad… It would be interesting to explore the dog’s role in the story and his reactions to characters, though I have neither the time nor inclination to do the searching for myself. 1. I am really glad I read the book- I had always been really reluctant , because I expected it to be horribly bleak and depressing, but I really enjoyed the sarcastic/satirical tone that Dickens used. The injustices weren’t lessened, but they were easier to read. 2. I thought that the women were actually depicted as being quite strong, when you consider that, in the eyes of the law, they were not people, only property. It is hard for us to read these depictions because we are allowed to take a stronger position in society. 3. I’m not sure if Dickens intended it that way, but to me, it was starting to get kind of soap-opera-ish funny, when every time something good would happen to Oliver, you knew it wouldn’t last. I was getting frustrated with how persistent the gang was to get him back, I found that very unrealistic, until the fact of the inheritance revealed that a lot more was at stake than a runaway boy. Two of your favorite quotes were also mine: “…no certain roof but the coffin-lid…” and “There are books of which the backs and covers are by far the best parts.”. 4. I really enjoyed the style and language- as it was serialized in the newspaper, I think the sarcastic tone was a dig at the “good Christian” people who would be reading it. I don’t think the tone downplayed the horrors of poverty at all. 5. If Dickens had written this in the present day, I think poverty and the treatment of poor people would still be an issue. Also, on a related note, the way people with lots of money can buy their way out of legal problems, while poor people are jailed and vilified by society for exactly the same crimes. Also, I agree with you that the education system desperately needs help. *And yes, that poor dog- WTF!! Thanks again for choosing this novel and for running the club! I also was expecting a novel about orphans, kind of a boy version of Annie haha. Boy was a wrong at times but Annie did have some parallels, eg rich person taking him in. I also agree with what you have to say about the role of women within the novel. You have made some very justified points especially in relation to Nancy and Oliver’s mum. Thanks for teaching me about the origins of this text. I found the long, windy introductions unbearable at times as well but makes complete sense now!! 1. Feelings/impressions/enjoyment: The main thing I struggled with throughout this novel was, ‘how on earth did this become a musical? ?’ Perhaps the shady characters are painted more comically…. Regardless, there wasn’t much to sing about. Very Les Mis’ in that department. Other than that, being a history nut, I loved the time period and the rough people that emerged. Even though the character of Oliver actually lacked ‘character’ I really admired his resilience and honesty. Excellent virtues to hold in such a dim and foggy world, such a beautiful contrast made by the author. In fact, I actually found myself hanging out for the appearance of this character again when he would be missing from certain chapters. I am guilty of tuning out at times so I think some of the story line and characters motivations were a little lost on me because I couldn’t concentrate or piece together parts of the story. Perhaps, like Tamsien said in her review, they changed? Overall I’m glad that I gave this classic the time of day. I had to keep remembering that this was the norm and this story was probably not written for women in the first place. However, I did soften when we met the lovely ladies of Mrs Maylie and Rose. The kindness and compassion for Oliver was touching. I liked how Dickens made the link between women at any social class as Nancy and Mrs Bedwin as well as Mrs Maylie and Rose. From the higher class showed the same drive to protect and care, I have no doubt that these women would have died for Oliver, like Nancy, talk about maternal instincts. Another quote I thought was beautiful and carried meaning was “The sun- the bright sun, that brings back, not light alone, but new life, and gope, and freshness to man-burst upon the crowded city in clear and radiant glory…”. It stirs the idea in my that each day brings something new to it. What a beautiful thought! 5. If Oliver Twist was set in the present day: This is tricky yet creative question as many social issues that Dickens experienced we are still dealing with today, eg domestic violence, child abuse. I think that the shadier characters, rather than being criminals could perhaps be painted as people who take advantage of government funding and try to cheat the system. Instead of workhouses we would perhaps be exposed to factory workers who are loosing their jobs to overseas factories that can produce the same products at a cheaper rate. Rather than orphanages I’m picturing youth detention centers where many teenagers are a product of the misfortunates that have been dealt to them in life… Unsure how these two would meet in a modern Dickens world however, perhaps the factories have programs to introduce the youths in to the workforce? ?